Paper Edger Scissors - FISKARS-Paper Edger Scissors: Clouds. Add pizzazz to paper edges. 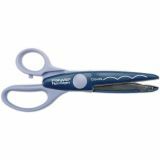 Whether it's a card, photo mat or other craft project there are endless options with this line of decorative scissors. For left and right handed use they are a definitely more economical than punches, specialty rotary cutters and many others. This package contains one pair of scissors with specialty color coded handles: each blade design features a different two-tone color combination. Imported.